AkioSurvey.com is online survey tool. AkioSurvey.com has a broad range of usage. The most common usage case is for organizing and evaluating online customer satisfaction survey. Popular use case is also running online employee satisfaction survey. Other common usage cases are making an online market research, performing online patient satisfaction survey, getting to know employee’s opinion on certain topic, doing 360 degree survey to evaluate employee’s performance, helping teams with decision making, make a quick poll to collect available options, get a feedback about recent changes in your organization and evaluate student’s satisfaction with subjects and teachers. This type of survey tool belongs to the group of so called SaaS (software as a service) applications. AkioSurvey makes creating online surveys very simple task thanks to its intuitive survey maker component. It offers 14 survey question types (including subtypes). The online poll question types include multiple choice, essay box, text box, date and/or time, address, matrix of choices, rating scale, informative image and informative text. Questions are inserted into online poll pages. Survey questions can be made mandatory. These mandatory questions will be marked with red star. It is very simple to copy, move or delete page or question. Pages can be also broken at selected point to create two pages containing corresponding questions from the original page. Online surveys can be color themed to the taste of the survey creator. 10 predefined poll themes are available. Other themes can be created by the survey owner. The Theme designer allows survey creator to set font sizes and colors for all response text elements. Themes can be used created once and used for multiple online polls. Online polls can also have logo of the survey creator. This survey logo can then be used for multiple survey instances. AkioSurvey supports logo transparency. Online survey distribution can be done via multiple channels. Most often used is sharing by web link. Other distribution options of online poll are sending the survey link in an email. There is also option to embed the online poll into your own page. Very popular is also survey sharing on social media. Akio Survey also offers option to identify survey respondents by sending them individually assigned links. Each link has to have assigned name. This name can be name of customer, name of company, email, Skype identificator or others. It is possible to view if response was already received for particular identifier and to review it. Survey response review analysis is logically divided to two parts – individual survey response review and survey summary. Individual online survey responses can be exported into XLS, CSV and PDF formats. Response summary represents received responses in graph multiple aggregated graphical representations. Available graphical representations vary depending on the online poll question type. The representations include vertical bar chart, horizontal bar chart, stacked vertical chart, stacked horizontal chart, donut chart, pie chart, line graph and area chart. Response summary can be exported into XLS, CSV and PDF formats. With this approach customer can create, distribute, run and analyze an online survey without having the need to purchase the permanent software license or hardware. The payment for Akio Survey application usage is time boxed with month granularity. 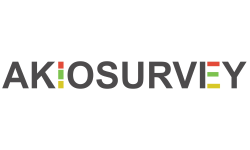 AkioSurvey.com offers 3 packages which vary in maximum count of surveys, questions and responses. The packages also vary in the features that is available in them. The packages are called Free, Standard and Professional. Custom redirect after survey completion, no ads on the survey response page, password protection, response count limit, email customer support, custom survey link, custom color themes and response exports are available only for the paid packages. Respondent identification, brand logo in the survey header and deactivation of AkioSurvey label in the footer is available only in the Professional package. Payments for the service can be done using PayPal. PayPal allows customers to safely pay for their survey tool using their credit card. Akio Survey creates invoice for the customer’s convenience.